The 16th century began the Jewish Renaissance in Prague. Prague nobility in 1501 allowed for an open atmosphere of economic activity�Yet during the Habsburg reign, the Jewish people were expelled twice in 1542 and 1561.�Each time they returned to prosper even more. From 1564-1612, the reigns of�Maximilian II�and�Rudolf II�were �golden ages� for the Jews in Prague. In the early 18th century, the Jews accounted for about one fourth of Prague�s population. More Jewish people lived in Prague than anywhere else in the world. This �golden age� ended with Empress Maria Theresa abdicating the throne, and expelling the Jews once again. Eventually the Jews were readmitted in 1748 after much influential intervention. 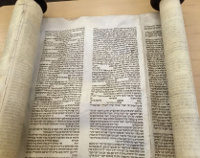 The Memorial Scrolls Trust, a U.K. non-profit organization, has recently begun to reach out to synagogues and other instititutions who received the Czech scrolls to gather updated information about them. They plan to continue to enhance their website so it becomes "a repository of all knowledge concerning the 1564 scrolls, the Jewish history of the towns they came from, the Jews of those towns, their fate, survivors� stories, photos etc. Also where the scrolls are now, how they are used and honoured etc." 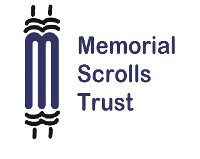 More information about the Memorial Scrolls Trust is available�on www.memorialscrollstrust.org. 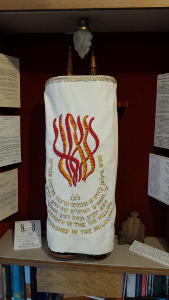 On May 3, 1970 the congregation held a very special Siyyum HaTorah and Kabbalat HaTorah ceremony and placed this Holocaust Torah in its new home in our library as part of the synagogue�s Holocaust memorial display. 1 All the history of the Jews of Prague comes from Wikepedia articles.